Research shows that hormones affect the development of a number of different types of cancers and benign tumors in human beings, dogs, cats, rabbits, and of course, rats and mice. In human beings, it is accepted that the chances of getting breast cancer are increased by early onset of menstruation, late menopause, and having/nursing no children—in other words, by conditions that allow hormones to circulate for a longer period of time. Women who menstruate later, have early menopause (or hysterectomy), or have children and nurse (and hence, have fewer years during which hormones are active), are less at risk for breast cancer. Similarly, dogs, cats, and rabbits who are spayed by the age of 6 months have an almost no incidence of mammary cancer. And male dogs who are neutered have, in addition to no chance of testicular cancer, a significantly reduced incidence of enlarged prostate and/or prostate cancer. In rabbits, the rate of ovarian and uterine cancer in unaltered females is thought to be as high as 80% over the age of 4, and dogs and cats are not far behind. Although laboratory tests have given us some of this information, by far the most useful statistics have come from vets and owners who deal with these problems in pet animals—in, as it were, the “real world.” This may be why there is a great deal of lab-based medical information out there about rats and mice, but very little about the incidence of cancer or other diseases in beloved pets. People like us aside, the percentage of small animal owners who consider their rats, mice, hamsters, and gerbils important enough for veterinary care is, unfortunately, very small. Unless the animals are used in a well-planned breeding program, it is generally accepted that all companion animals are better off surgically altered. Still, the statistics mentioned here regarding human, canine, feline, and lapine cancers and benign tumors should sound familiar to rat and mouse folks, because little rodents, too, fall victim to just these cancers, or develop benign tumors that can be equally devastating. Mammary tumors and tumors of the reproductive tract are two common causes of death in female rats, and testicular cancer in males is well-documented. It is also possible that many cases of generalized tumors may well have started with the reproductive organs or mammary glands. So although there is very little “official” recognition that neutering and spaying rats and mice extends their lives, it is simply common sense that what works in every other domestic species should also work with rats. In my own mind, there is no doubt that neutering and spaying rats should have the same effect on these little animals as it does on cats, dogs, and rabbits—longer, happier, cancer-free lives. In addition, it is readily accepted by animal behaviorists that neutering/spaying reduces territorial and aggressive behavior in dogs, cats, and rabbits. It also improves house training, makes intraspecies relationships more pleasant, and generally improves relationships between animal and owner by removing the significant distraction of hormones and allowing the animal to concentrate on other things. Unless the animals are used in a well-planned breeding program, it is generally accepted that all companion animals are better off surgically altered. Because we believe this, in the past 8 months we have had four male rats (Fergus, Tristan, Linus, and Oliver) neutered. This was not a decision we approached lightly, because having worked for vets in the past, I know the dangers of anesthesia, particularly in the smaller species. However, we had noticed that Fergus was beginning to mount Phineas (an older, more sedate male) and harass him. While the two rats did not exactly fight, we could see that Phineas was annoyed, and wanted to do all we could to preserve the wonderful, loving relationship they had enjoyed since Fergus was 8 weeks old. Although neutering might have benefited Phineas as well, we decided not to risk it, since he was 18 months old at the time and hence, a greater anesthesia risk. We also wanted to neuter Tristan, who had lived alone since we got him at the age of 6 weeks, so that he would be able to live with the other guys. To this end, we had purchased an enormous (36"x30"x60" tall) aviary which I remodeled for the rats—our hope was that once Fergus and Tristan were neutered, all three rats would be able to live happily together in their “rat palace.” In addition, we hoped that we would be increasing their time with us by reducing their chances of getting certain types of cancer or benign tumors. Our vet, Dr. Michael Lutz, sees a large number of birds and small animals, works with wildlife rehabilitators, and had neutered several hamsters prior to our rats. An important difference from cats and dogs, which rats share with rabbits, guinea pigs, and hamsters, is that male rats have an open inguinal canal. Instead of being separated from the abdominal cavity by a “wall,” the testicles can actually be drawn up inside the cavity to protect them. In rabbits, this canal is usually closed to prevent inguinal herniation, and Dr. Lutz and I discussed whether or not this was necessary in the rat. Some rodent vets recommend performing the surgery abdominally in order to have a clear view to close the inguinal canal, rather than going in through the scrotum to remove the testicles. However, Dr. Lutz told me that because of the increased risk from lengthened anesthesia and abdominal surgery, and because he had never had a case of inguinal herniation, he felt the safer option was to leave the canal open. The incision itself was, of course, closed; Dr. Lutz opted to use surgical glue, which is particularly non-irritating, and hence, more likely to be left alone. After discussing the matter, Marc and I decided to defer to Dr. Lutz’s experience with the little guys, and true to his word, all the rats healed well and quickly, with no sign of herniation. Because the abdominal technique is specialized, many vets may not have experience doing it. This is another reason why we opted for scrotal incisions; asking a vet to test an unfamiliar method on our rats did not sit well with us at all.
. . . male rats have an open inguinal canal . . . the testicles can actually be drawn up inside the cavity to protect them. Because we were very nervous the first time, we waited until Fergus was 6 months old and 360 g before having him neutered, but had Tristan’s surgery done when he was only 3 months and 290 g. Both Oliver and Linus were adopted as adults—6 months and 9 months, respectively—and were neutered a week after joining our family. Of all the rats, Tristan, the youngest at the time of surgery, had the fastest recovery and seemed the least affected by the procedure. Because rats (like rabbits) do not vomit, there is no risk of aspiration under anesthesia (the reason why humans, cats, and dogs are fasted prior to surgery). Consequently, the rats had food and water in front of them up until the time we took them to the vet’s and as soon as we got them back home. We transported them in a carrier intended to go under an airplane seat, and while they were at the clinic they resided in a tank with a PVC pipe to provide privacy. The rats went in at 9 A.M. and were ready to go home by 2 P.M. that afternoon. The primary reason they were ready so quickly is that the anesthesia used was isoflurane (brand name Aerrane), which is extremely safe. Unlike most inhalant anesthesias, which are absorbed into the bloodstream and take many hours to dissipate, only 2–4% of isoflurane is absorbed into the blood. The rest is breathed out with the next breath. Because its effects can be reversed almost immediately simply by removing the mask, iso is very safe. If the animal gets too deep, he can be brought out right away, rather than waiting the many minutes necessary with other inhalants or injectables. For all the neuters, Dr. Lutz used a very small dose of an injectable anesthetic to get the rats “loopy,” then maintained the level of anesthesia by masking them with isoflurane. It is also possible to “mask down” small rodents by putting their entire bodies into a mask intended for large dogs. Although he was alert and active when we picked him up at the vet’s, Fergus was not hungry the first night or the next morning after surgery. The second night he ate a small amount of carrot and broccoli, but was not interested in his usual low-fat dog food, and even the sunflower seeds I left to tempt him were untouched. But by the third night he was eating and drinking normally, and he seemed none the worse for his fast. I added vegetarian acidophilus to his drinking water, which he sipped from the first day after surgery, in an effort to maintain a beneficial balance of bacteria in his gut. Linus and Oliver (who were neutered at the same time and kept together before and after surgery) seemed more affected by the anesthesia than Fergus, and more tired and worn out by their day at the vet’s office. But the first night they ate fruit and veggies, as well as a little dog food, and by the next morning seemed energetic and happy. Linus (cream) and Oliver (Hooded) sleep it off after their neuters. Perhaps because he was younger and less well-developed than the others, Tristan’s neuter went even more smoothly. He was slightly subdued when we picked him up, but by evening Tristan seemed himself, and during the night he ate fruit, veggies, and dog food. From then on his appetite was excellent, and he never looked back. Because of the surgical glue used in the rats’ incisions, there was no need to return to the vet for suture removal. The incisions healed quickly and without incident; I checked them twice a day to make sure there was no swelling or opening. The advantage of glue over sutures is that most animals never even notice its presence, thereby reducing the chances of chewing and removing suture material. We restricted the rats’ exercise for 3–4 days after surgery, keeping them in a tank with no toys and only the PVC pipe for privacy to prevent them from climbing or jumping. We removed them only for their twice daily incision checks. Four days after surgery we reintroduced Phineas and Fergus (with the help of a little oil of eucalyptus to give them a similar smell), and things went fine. Now they get along better than ever, with Fergus behaving more solicitously towards Phineas and no longer mounting him. One week after Tristan’s surgery, we introduced him to the other guys. To prevent territoriality, I moved no one into the new cage until I moved them all in. This way, the cage smelled a little like them all, but not particularly like any one of them. In addition, we arranged to introduce them in the morning, when they were starting to get sleepy from a long night of playing and foraging. Once again, I put a little oil of eucalyptus on all three rats (lemon juice also works), put their two nest boxes and some broccoli into the cage, and moved them all into their new home. With a little minor tussling to establish rank, Phineas and Fergus accepted Tristan quickly and happily, and since then the rats have never argued and seem genuinely fond of each other. Fergus has calmed down, probably from a combination of the effects of neutering, having more space in which to exercise, and having a friend his own age to play with. Phineas has benefited too, because while the younger ones love him and spend time with him, Tristan is now more likely to be jumped on and rolled over in play by Fergus than Phineas is. Although at first I provided two nest boxes and plenty of PVC tubes, within a few days all three rats were crowding into one nest box to sleep, and we knew our plan was a success. Today, 8 months after Fergus’ neuter, we have three happy male rats who love each other—and their new female friend, Fiona—and live in harmony. 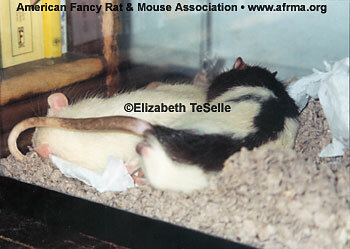 Our next goal is to introduce Linus and Oliver—and perhaps another female rat or two!—into this mix. Note: Our reasons for having only male rats originally were first: that we wanted the rats to live together but did not want to breed, and second: that we were wary of females because of their tendency to develop tumors. Now that we feel confident about neutering male rats, we are wondering if there is a possibility we could have Fiona spayed. Our vet does not have experience doing this. It is a far more serious surgery, and we will approach it with a great deal of caution.